The gateway to the Oval Office is the media. On the campaign trail, you need to master your handling of them, both on camera and off, to get elected. It is the most important prerequisite because, once you are elected, controlling what comes out of the televisions to the eyes and ears of hundreds of millions of people defines a President. From Nixon sweating on TV in those early televised debates to former actor Ronald Reagan’s mastery of the media to Clinton’s telegenic persona, tube appeasement was job one, until we got to George W. Bush. For W., who makes the suspects on cops look articulate, tackling the media head-on was not a winning strategy, so he went negative. The Attack and Avoid plan, which W. used to minimalize and marginalize the press, was effective. Call the media irresponsible, or, in the case of 9-11, unpatriotic, and put them on the defensive. Hand out stories to friendly sources like Fox News, and refuse to speak with journalists like Helen Thomas because they won’t toss you softballs. Get hit with a question like your Guantanamo policy being unconsitutional? Deny and denigrate the media for questioning the executive powers of the President. Do very few press conferences in your first term so you can avoid slipping up. Do even fewer public addresses. The short-term wins of the mushroom theory of media handling may have saved the day or the news cycle, but they ultimately cost Bush’s administration in the bigger picture of both his agenda and his place in history. By the time that he got to his second term, and eased up a bit on the media lock-down, he had already turned off and tuned out most of the nation to the White House. His failure to speak regularly had cost the office stature internationally. Despised and mocked around the world, and here at home, his history-making disapproval rating has impacted his legacy because his lack of command over the media leads to the tidal wave of speculation and pontification by talking heads and political “experts” who have been allowed to define his presidency to mean pretty much whatever they think it means. Clinton was a great communicator with the American public, but his gamesmanship with the media was largely what affirmed his nickname, “Slick Willie.” The GOP used Whitewater, which cost the public millions, to tie up Clinton’s administration as much as possible, and to set up the springboard to motivate their religious right wing base with accusations that Clinton was morally improper on a wide variety of fronts. When he was caught lying in the Lewinsky scandal, all of the good work that he did as President became mired in his personal foibles, and the media chewed up what was left of his political stature. 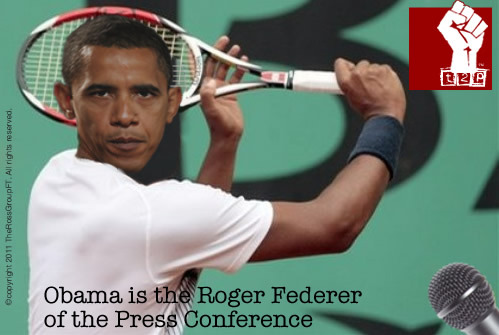 Barack Obama is the Roger Federer of the press conference. He plays the game to win. He usually stays three moves ahead of his opponents with the pads, tape recorders and cameras. The media may find Obama dryer than Clinton, but if he is anything, the President-Elect is the consummate craftsman of his message. He serves up answers with heat, and the surgical precision of a cardiologist. Look at the speech on health care from December 11, 2008, the text of which appeared recently in the New York Times. That sets up the agenda for what Obama knows will be the lead questions in the Q&A session. When he gets there, President-elect Obama is a master of listening to the question, parsing it, serving up very specific answers, and politely nailing the media people who ask him something on ground that he’s already covered. The governor Blagojevich situation is Obama’s French Open. The press is testing Obama to see if he walks the walk, and if he can stay on top. There is nothing to suggest that Obama had anything to do with governor Blagojevich’s putting the soon-to-be open Illinois senate seat up on political eBay. If anything, the government sting operation transcripts would show that Blago had some pretty unkind things to say about Obama and his staff. “[T]hey’re not willing to give me anything except appreciation,” was the most printable thing that Blagojevich said in a taped conversation that was filed as part of the criminal complaint last Tuesday. Mr. Obama: “Well, let me repeat a couple of things. Number one, I think, like most of the people of Illinois, I was appalled and disappointed by what we heard in those transcripts. And, you know, here in Illinois — as is true, I think, across the country — there is a tradition of public service, where people are getting in it for the right reasons and to serve, but there’s also a tradition where people view politics as a business. And part of the reason that I got into politics, ran for the State Senate, ran for the United States Senate, and ultimately ran for the presidency is because we have to reclaim a tradition of public service that is about people and their lives, and their hopes, and their dreams. And it isn’t about what’s in it for me. And I think the public trust has been violated. Obama speaks very purposefully. His “Well, let me repeat a couple of things” is a very clear shot to the reporter for framing the question in a way that is covering the ground already in the transcript. With Bush, you would ask the question because you knew that someone else probably framed the speech, and you wanted to know what was on Bush’s brain, scary as that thought may be. Plus, there was always the entertainment value of watching him fall all over his tongue, with the likelihood that a Bushism like “the Decider” might ooze out. There is some retooling for the Obama press conference. You cannot send in your your second bracket journalist. The sad thing is that a media that has been accustomed to nearly a decade of the information fortress at the White House may have a little trouble getting back into mental shape for a president who is going to be more than their intellectual and political equal. Sure, there will be days that Obama is off of his game. His lightening serve will just miss its mark, or he will miss the return of a media volley. His staff has been a little off-game in getting in front of the Blago-blast from the media, but it is a minor lesson for them in handling the media that was well-learned at a pretty minimal cost. For me, it is a refreshing change to hear a president who can articulate his policies articulately, although I have to say that George W. Bush will be missified lots. This entry was posted on December 15, 2008 by Brian Ross in 2008, Barack Obama, Bill Clinton, Fox News, George W. Bush, GOP, Media, Politics, The White House and tagged Barack Obama, Bill Clinton, Bill Clinton Charismatic, Bush Administration Media, Bushisms, French Open, George W. Bush, Media, Media Coverage Of Obama, Media News & Criticism, Nixon Televised Debate, Obama And The Media, Obama Press Conference, Presidential Press Conference, Roger Federer, Tennis.